The rented rooms kristallia bring many years experience, offering excellent quality in food services and accommodation. 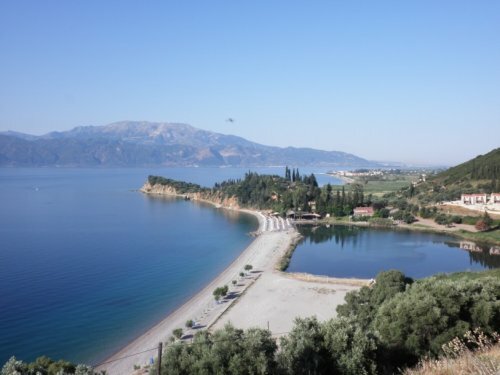 Located in the seaside village of Monastiraki Phocis prefecture (about 10 km from Nafpaktos) and just 100 meters from the sea. This is a very beautiful and picturesque destination well worth visiting and is the ideal place for both summer and winter excursions. The unique location of the village combines mountain and sea. Come and enjoy the crystal clear waters of the beautiful beaches such as "Parathalassos" και "Geropicoula", which have earned the Blue Flag by the European Union. The rented rooms Κristallia are located in the heart of the village and within walking distance of all the entertainment and relaxation. Available furnished and fully equipped rooms, including kitchen, fridge, TV, air-condition, individual heating (for winter months) and bathroom. The price of the rooms is 35 € for each night. Contact us for any information and we will be glad to assist you. You can reach us by phone at 0030-26340-53283 (fixed) and 0030-693-7346613 (mobile). For more contact details click the tab "Contact Us".